Fig. 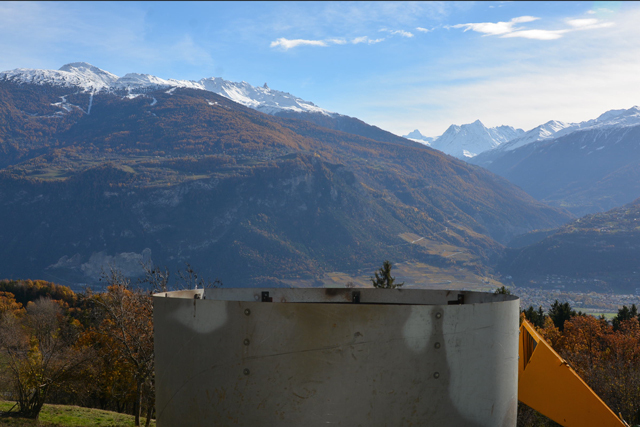 1: Biochar production in the Swiss Alps. Fig. 3: These burn piles in the Oregon woods illustrate the difference between lighting a fire on the top (left) or lighting it near the bottom (right). Images: Kelpie Wilson. 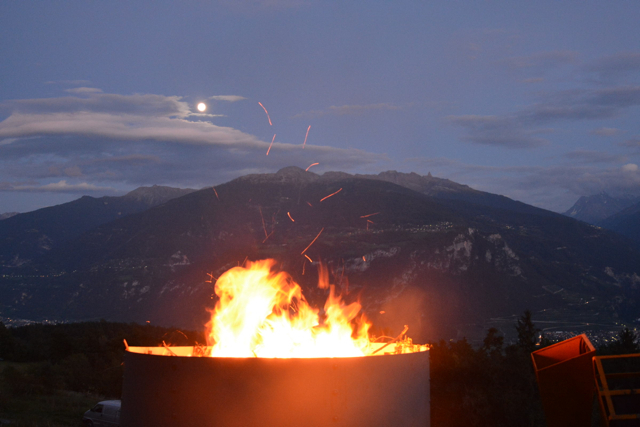 The fundamental principle of the smokeless fire was the starting point for our design of the Kon-Tiki, an open-topped conical kiln for making biochar. We chose the name Kon-Tiki in memory of Thor Heyerdahl, who asserted in the ‘40s of the last century that the inhabitants of South America were able to cross the Pacific to Polynesia in handmade boats. 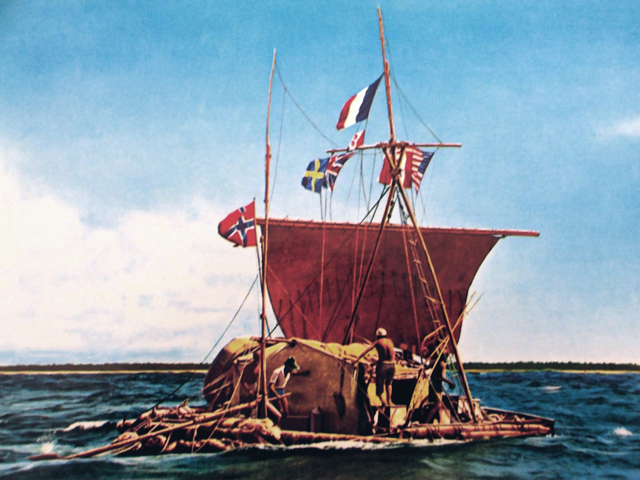 The experts virulently attacked Heyerdahl’s theory until he finally silenced them by building such a boat with only the tools and materials of the South American natives, and crossing half the Pacific from Lima to Polynesia. He named his boat Kon-Tiki after the South American god of sun and fire. Fig. 4: With this raft, built only with native South American materials and tools, Thor Heyerdahl crossed half the Pacific Ocean in 1946. He named it after the fire god, Kon-Tiki. Fig. 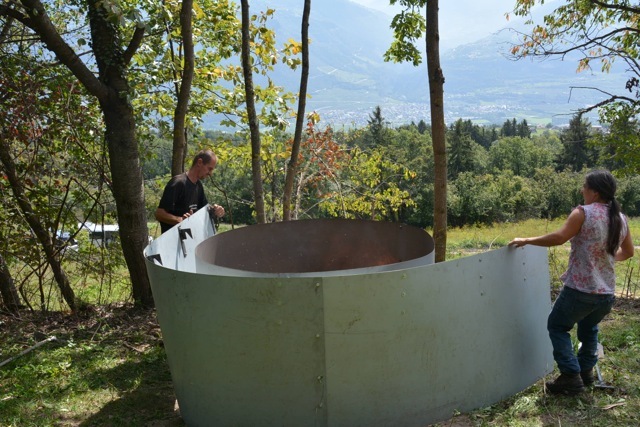 6: Production of biochar in a 90 cm deep pit with a stone rim (Images: Ithaka-Institute). An investigation amid the global biochar community showed rapidly that we were not alone on the road of this development. At her most valuable Backyard Biochar website Kelpie Wilson had already presented examples of the Japanese Moki-Kiln, the Australian Moxham Kiln, Kelpie Wilson’s own Pyramid Kiln and new cone and pyramid designs by Michael Wittman, Gary Gilmore and others. With the exception of the Moxham all these kilns are comparatively small and more suitable for gardeners and hobbyists, but the principle is clear: produce biochar using the fire and not by suppressing it. We also took as inspiration the form of fire containers that were used throughout the Orient for the offering of religious sacrifices. 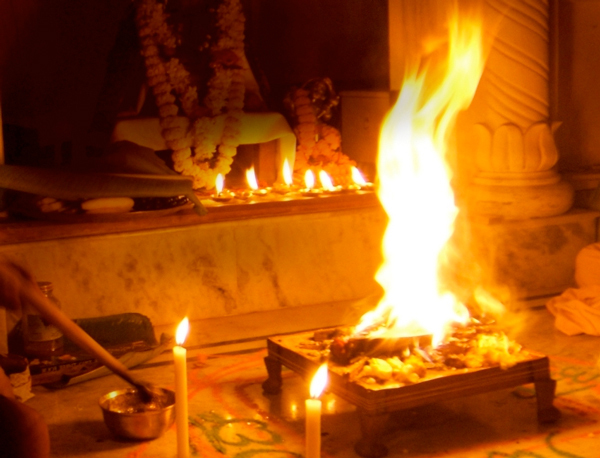 Under the name of Agni Hotra, the Vedic fire ritual, they are still widely used today in India. The size of the Agni Hotra bowls is generally small, but for temple rituals, there were larger fire bowls made of copper. The dynamics of smokeless flames over the fire pits, dancing to the heavens, clearly showed that we were on the right track with the physics of fire. Fig. 7. The Vedic Agni Hotra ritual (image: agnikultur). Figure 8: The first Kon-Tiki had a diameter of 150 cm, a height of 90 cm and a capacity of 850 liters. It was built by Markus Koller. Fig. 9: Air is drawn in over the hot outer wall of the kiln and swirls above the fuel bed creating a vortex that ensures good mixing of pyrolysis and combustion air, resulting in very low emissions of the Kon-Tiki kiln. Fig. 11: Once a strong ember bed brings the pyrolysis temperature up to 700 ° C, fresh wood can be added. The Kon-Tiki functions as both a feedstock dryer and a pyrolyzer. Fig. 12: Igniting the wood chimney in the middle of the Kon-Tiki. Fig. 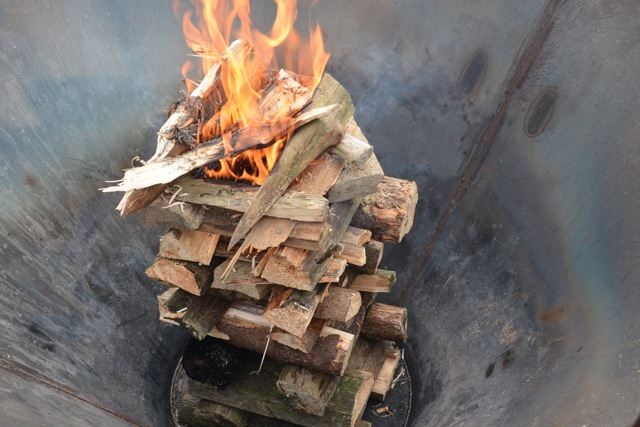 13: When the top layer of biomass begins to coat with ash, it is the right time to add the next fuel layer. The biomass becomes completely charred then in the lower layers. Fig. 14: Mounting the rim shield to optimize combustion dynamics. Fig. 15: Quenching from the top with water. Fig. 16: Crystal clear quench water is the best sign of clean pyrolysis. The quench water can be left for a few hours or even days in the kiln. It drains out easily through the water tap at the bottom. The quench water looks clean and transparent, but it is soapy and has a very high pH. While the high pH is due to the approximately 10% ash which results from the flame cap pyrolysis process, the soap is formed by the reaction of the ash with pyrolysis oils, which are expelled from the pores during quenching of the char. This soapy quench water is apparently excellent for pouring on fruit and vegetable plants. It discourages snails and fungus and generally acts as a tonic to the plants. The latter statement is based on personal observations of only two dozen plant species so far; systematic scientific investigations are still pending. 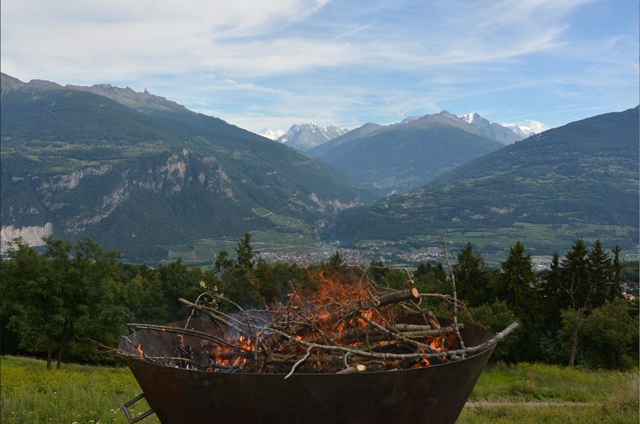 Biochar quenched with water generally fulfills all the requirements for the premium quality of the European biochar certificate (EBC, 2012). 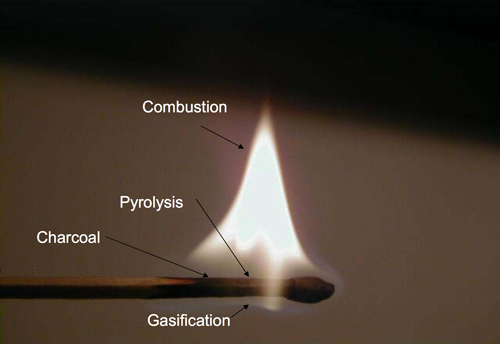 The flame cap pyrolysis principle guarantees that the vast majority of the pyrolysis gas is expelled from the biochar and burned, not stuck on the biochar surfaces and pores in the form of toxic condensates (Bucheli et al., 2015). 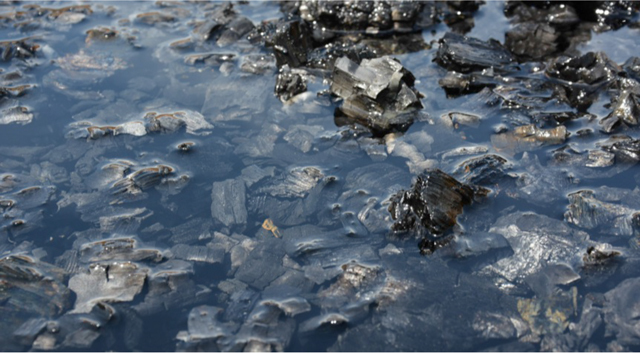 The biochar is additionally cleaned and partially activated when slow quenched with water from the bottom. Please find here an EBC analysis of a vine root biochar made with a Kon-Tiki. What we call Kon-Tiki is not a finite form but the technical realization of the flame cap pyrolysis principal. And this has many inventors and will result in many varying designs. All are invited to participate in this movement to reappropriate the craft of fire and biochar making. With numerous partners in various countries, we are currently working on optimizing the geometry and thermodynamics of the Kon-Tiki. For a North American university, we have just developed a research Kon-Tiki, with which all parameters can be monitored and combustion can be measured and controlled by metering the air intake. A giant Kon-Tiki was built to char large root wads with minimal size reduction for a composting facility. We also develop smaller sized Kon-Tikis for small gardeners who can use it to char their green residues and organic waste. The next technical development step will be the integration of heat recovery. One Kon-Tiki load produces more than 1 MWh heat, enough to heat a poorly insulated farmhouse for two weeks. These and other developments such as the automation of char removal will be the subject of future articles in the Ithaka Journal. Fig. 16: A master of the Kon-Tiki craft will learn to pyrolyze with fire, and like in this picture, with no visible emissions. The cigare of the char master makes more smoke than the Kon-Tiki, which produces 1 MWh of heat in an afternoon. PS. 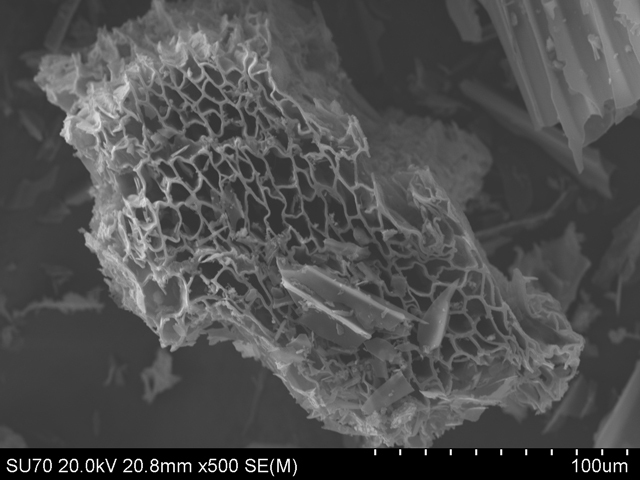 : In the meantime we published some scientific articles about the biochar quality and emissions of Kon-Tiki kilns as well as about the application of Kon-Tiki biochar to enhance crop growth. These articles were published open source an can be downloaded for free (Fourfold Increase in Pumpkin Yield in Response to Low-Dosage Root Zone Application of Urine-Enhanced Biochar to a Fertile Tropical Soil and Emissions and Char Quality of Flame-Curtain “Kon Tiki” Kilns for Farmer-Scale Charcoal/Biochar Production). Bucheli, T.D., Hilber, I., Schmidt, H.P., 2015. Polycyclic aromatic hydrocarbons and polychlorinated aromatic compounds in biochar, in: earthscan, London, U. (Ed. 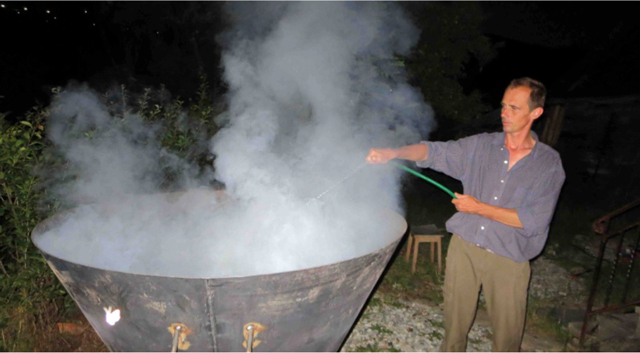 ), Biochar for Environmental Management: Science and Technology. Carlowitz, H.C. von C., 2013. Sylvicultura oeconomica oder Haußwirthliche Nachricht und Naturmäßige Anweisung zur Wilden Baum-Zucht, oekom verl. ed. München. Criscuoli, I., Alberti, G., Baronti, S., Favilli, F., Martinez, C., Calzolari, C., Pusceddu, E., Rumpel, C., Viola, R., Miglietta, F., 2014. Carbon sequestration and fertility after centennial time scale incorporation of charcoal into soil. PLoS One 9, e91114. Eckmeier, E., Gerlach, R., Tegtmeier, U., Schmidt, M.W.I., 2008. Charred organic matter and phosphorus in black soils in the Lower Rhine Basin (Northwest Germany) indicate prehistoric agricultural burning. In: Fiorentino, G; Magri, D. Charcoals from the past: cultural and palaeoenvironmental implications, in: Fiorentino, G., Magri, D. (Eds. ), Charcoals from the Past: Cultural and Palaeoenvironmental Implications. Oxford, pp. 93–103. Fang, J., Xie, Z., 1994. Deforestation in preindustrial China: The Loess Plateau region as an example. Chemosphere 29, 983–999. Gammage, B., 2012. The Biggest Estate on Earth. Allen&Unwin, Sydney, Melbourne, Auckland, London. Gerlach, R., Baumewerd-schmidt, H., Borg, K. Van Den, Eckmeier, E., Schmidt, M.W.I., 2006. Prehistoric alteration of soil in the Lower Rhine Basin , Northwest Germany — archaeological , 14 C and geochemical evidence 136, 38–50. Gerlach, R., Fischer, P., Eckmeier, E., Hilgers, A., 2012. Dark soil horizons and archaeological features in the Neolithic settlement region of the Lower Rhine area , NW Germany : Formation , geochemistry and chronostratigraphy. Quat. Int. 1, 191–204. Glaser, B., Birk, J.J., 2012. State of the scientific knowledge on properties and genesis of Anthropogenic Dark Earths in Central Amazonia (terra preta de Índio). Geochim. Cosmochim. Acta 82, 39–51. Schmidt, H.P., 2012. 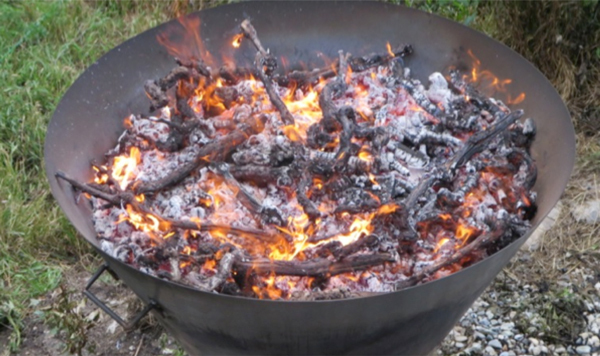 55 uses of biochar. Ithaka J. 1, 286–289, www.ithaka-journal.net. Schmidt, M.W.I., Noack, A.G., 2000. Black carbon in soils and sediments: Analysis, distribution, implications, and current challenges. Glob. Biofeochem.Cy. 777–793. Shackley, S., 2014. Shifting chars? Aligning climate change, carbon abatement, agriculture, land use and food safety and security policies. Carbon Manag. 5, 119–121. Willcox, G.H., 1974. A History of Deforestation as Indicated by Charcoal Analysis of Four Sites in Eastern Anatolia. Anatol. Stud. 24, 117. This entry was posted on Tuesday, November 25th, 2014 at 02, Nov and is filed under climate-farming. Am 29. November 2014 um 16:55 Uhr Title: Grossartige Forschung - danke! Am 2. December 2014 um 14:00 Uhr Title: Stoh verkohlen? Emmental Forest Cooperation EFCO arbeitet mit afrikanischen Kleinunternehmern in abgelegenen laendlichen Gegenden von Tanzania. Das Land hat ein “big dirty energy secret”, will sagen: Der Holzkohleverbrauch fuers Kochen ist landesweit so hoch und steigend, dass bis in 30 Jahren kein Baum mehr stehen duerfte. Gleichzeitig brennt die Savanne in riesigen Flaechen jedes Jahr ab. Das hohe duerre Gras und Staudengestruepp setzt oft riesige Mengen an Energie frei und ist eine Gefahr fuer gepflanzte Baeume und generell fuer den rasch schwindenden Wald – die Energie muesste man nutzen koennen! Frage: Wird es moeglich auch “Stroh” oder gar “Strohhaecksel” mit dem Kon-Tiki zu verkohlen? Wisst ihr das schon, oder muesste man das erst noch ausprobieren? Falls ja, dann sehe ich Teams von jungen Leuten ueber Monate hinweg solche Kon-Tikis fahren und Graskohlestaub an Pressanlagen liefern und sich so ein Einkommen sichern. Der Kohlestaub wuerde dann zu Briketts gepresst als Alternative zur Baum-basierten Holzkohle welche gegenwaertig gebraucht wird (spaeter sehe ich auch Vergasung von solchen Briketts zwecks Betreiben von Traktoren, Generatoren, usw). Mich interessiert, ob Sie auch schon statt mit einer Konusform mit Pyramidenform, z.B. einer hexagonalen Pyramide “Pyra-Tiki” experimentiert haben. Wen schon eine Öffnung am Boden des Kon-Tiki vorhanden ist für späteres “Quenchen” bzw. aktivieren der Pflanzenkohle mit Wasser..
Wir haben auch achteckige Kon-Tiki zum Zusammenschrauben gebaut, so dass sie als “flat-pack” verschickt bzw. transportiert werden können. Wenn man die Einzelteile in Serie mit entsprechenden computergestützten Maschinen bauen kann, ist dies sehr interessant, wo allerdings wie hier selbst Biegemaschinen nicht verfügbar sind, stößt das große Geschick der Handarbeiter bei 3mm Stahl an seine Grenzen. Ausserdem sind hier die feuerfesten Abdichtbänder nicht verfügbar, um die verschraubten Stöße zum Quenchen dicht zu bekommen. Da es Schweißgeräte und Flex quasi in jedem Dorf gibt, haben wir uns für Entwicklungsländer zu achteckigen, verschweißten Kon-Tiki entschieden. Am 14. January 2015 um 13:56 Uhr Title: Zerkleinern? Bisher habe ich immer die rohe Biochar im Komposthaufen verwendet und auch erst im Hühnerstall, in der Bodenstreu besonders dort wo die 15 “Federdamen” und der Hahn auf ihren Sitzstangen übernachten. Dabei ist es doch genial Suppe oder Kaffee zu kochen und als “Nebenprodukt” Holzkohle herzustellen. Mit der Fokussierung auf den Durchsatz an Holzkohle geht der Gedanke ineinandergreifender Kreisläufe doch wieder verloren. Meiner Meinung nach ist die Mehrfachnutzung der eigentliche Clou. Wer die wertvolle “Abwärme” ebenso nutzt wie die Holzkohle hat den nächsten Schritt getan. Wer dazu noch seinen Mikrovergaser aus vorhandenen Materialien selbst gebaut hat ist schon zwei Schritte weiter auf dem Weg zur Demokratisierung der Pflanzenkohleproduktion. …” Viktor Schauberger hat sich oft mit dem Einwirbeln von Flüssigkeiten, vor allem von Wasser, beschäftigt, da das seine Eigenschaften sehr verbessern soll. Der Wirbeltrichter muss hyperbolische Form haben und das Wasser wird tangential eingestrahlt, wie auf dem Bild schön zu sehen. Der Trichter ist aus Kupfer, da dieses Metall außerdem noch positive Auswirkungen auf die Pflanzen haben soll. Die Holzkohle ist in der Tat der schwierigste Faktor. Nicht nur weil teuer, ich möchte auch nicht meine Gartenabschnitte “wegwerfen” und Holzkohle über weite Strecken transportieren lassen.